Many migraine sufferers are not aware that their migraines may be caused or made worse by TMD (temporomandibular joint disorder). They may not know that a problem involving the teeth and jaw could cause such intense pain. Also, primary physicians do not always consider TMD as a possible cause of migraines since they usually are not trained in neuromuscular dentistry. The latest research shows that Migraines occur due to activation of the trigeminovascular system (TGVS) which consists of the trigeminal nerve (the trigeminal nerve supplies sensation to the head, face, lips, jaws and sinuses) and nerve fibres which innervate blood vessels inside and outside the brain. Head pain occurs when these blood vessels dilate following release of a ‘soup’ of neurochemicals due to activation of the TGVS. This ‘soup’ of neurochemical also causes inflammation. Activation of the TGVS can occur due to stimulation of the nerve endings of the trigeminal nerve. The trigeminal nerve endings are located in the cranium, face, teeth, jaws, jaw joints and face/jaw muscles. Therefore, painful stimulation from any of these areas can cause activation of the TGVS and ultimately migraines. Migraine is the most prevalent primary headache in individuals with temporomandibular disorders (Journal Of Orofacial Pain, 24(3), 287-292). 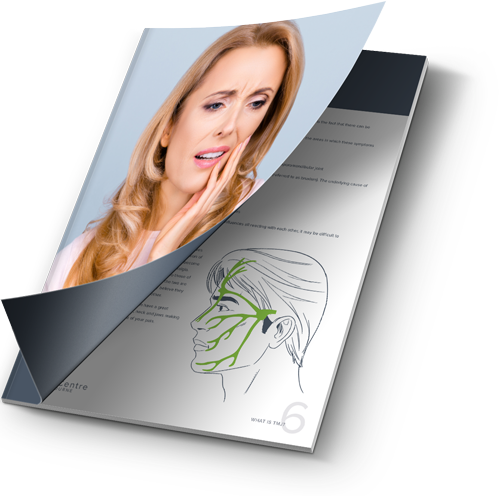 Please come in for our comprehensive TMJ diagnosis.